My experience with TomTom CityMaps and RoutePlanner has long proved to me that mapping is one of the killer apps for the PDA. As stand alone programs they are just invaluable, but add the extra dimension of GPS and you start what our American friends call "pushing the envelope." The Navman 1000 comes from the same pedigree as the 3000i reviewed elsewhere on PDA Pro, but is very different in that instead of coming in a chunky, hernia inducing sleeve, slips neatly into a CF1 slot. Any doubts that the relative small size of the kit (pictured right) was going to affect performance was soon cleared. For most of this test the Navman was driven around in my old Daihatsu FourTrak, the bodywork of which is 90 per cent metal. However, the signal came through loud and clear. If, for whatever reason, you lost the signal, it was impossible to get the system up and running again without stopping. This was also true in my wife's Mondeo on a trip to York. In the box is a plethora of bits of plastic to enable you to "adhere" the universal mounting bracket to the windscreen and two vehicle power adapters, one for Hewlett Packard PDAs and the other for the iPAQs. 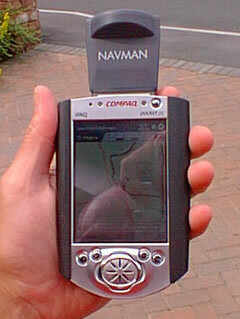 The Navman comes with Smartpath Trip and City software, which is TomTom Routeplanner and CityMaps rebadged. I did uninstall my TomTom software and tried Smartpath but there was some nanny state message warning about driving cars while using GPS, so I reverted back to my original TomTom setup with the Navman 1000 GPS driver software loaded. Kickstarting either CityMaps or RoutePlanner you go to the Properties menu to find the GPS options. These are very simple to use and there is the vital facility to keep the PDA switched on during your journey. This removes the threat of the PDA turning itself off via the default settings, you loosing the satellites and having to start from scratch. The initial time to first fix was surprisingly fast - less than 90 seconds, although this was lengthened on subsequent uses for some reason. If you have a low boredom threshold, there is plenty going on screenwise in the way of vertical bar charts and satellite locations. Plotting the route is simplicity itself and once you are on the move that old friend, the little blue arrow, traces your progress. On one drive down from the fells to Penrith, I deviated from the planned route along some backrounds and the GPS trackers kept me comfortable with the arrow pointing towards my destination and letting me know I was going in the right direction. During the two weeks of testing I was not aware of any serious deviations in terms of accuracy and had I been able to use the device on a recent trip to the remote Mani peninsula in Greece I would have happily followed its suggested course. There are downsides to the Navman 1000. First, because it eats up your CF slot, there is no facility to store maps on a CF card. If you have 64mb as basic memory this may not be a problem. But if you had just 32mb basic memory and you needed to take along detailed maps then there is not a lot of scope for other third party software such as PIMs e-books, expenses programs, etc. direction in which you are heading. software, I decided to go "off piste." Second, if for whatever reason you lost the satellites signals there is no way to recover the positioning while on the move. Twice this happened to me and on both occasions I had to stop and wait for the system to restart and realign itself. If the unit had come with an external antennae then I am sure this could have been overcome. Third, pricing. At £239.99 (€389.00) I feel that the unit is overpriced, particularly in the light of the CF slot limitations. In terms of its size/power ratio the Navman 1000 is an efficient little piece of it, but the lack of CF support is the main drawback for those who travel widely and need to carry a substantial number of maps.